Try our fabulous Drill Brush and Pads Set for all your cleaning applications around the house. 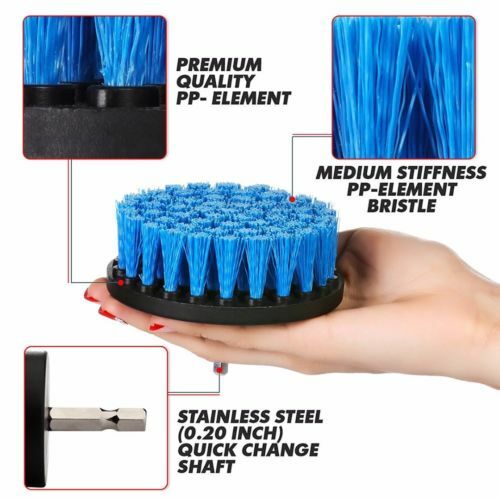 These are great brushes for the above average homeowner who wants to make cleaning more enjoyable and less difficult. 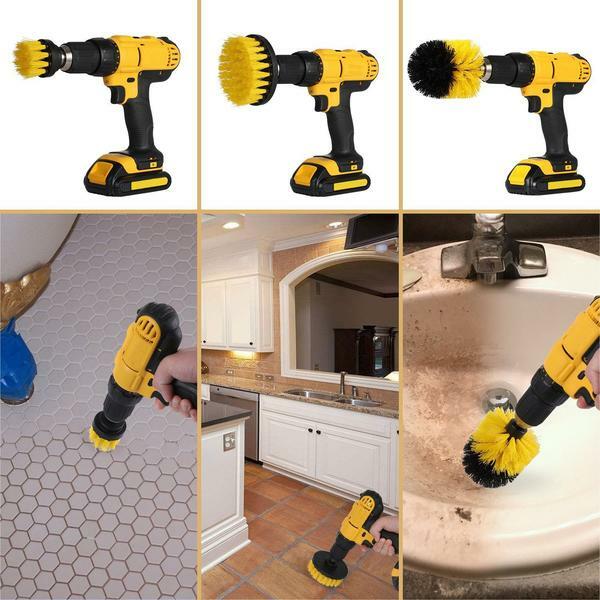 These Drill Brushes turn boring tedious cleaning jobs into challenging and successful projects. Use your imagination and these brushes will most likely be able to assist you in your cleaning project. Great for Cleaning Tile and Grout, Shower Pans and Tubs, Dirty Sinks, Glass Stove Tops, Baseboard and Floors, Counter Tops and many more! 1/4 inch quick change shafts fit most universal drills and drivers (Cordless Drill NOT Included). The brushes easily attach to a drill, they really help to save time, they do a much better job than scrubbing by hand. The brushes are made of 100% polypropylene bristles which is the most durable material out there for bristles to be made from. Comes in 3 different colors! Windows, Shower Doors, Sinks, Tubs, Tile and Grout, Faucets and Fixtures, Carpet, Doors, Baseboard, Glass Stove Tops, Ovens. 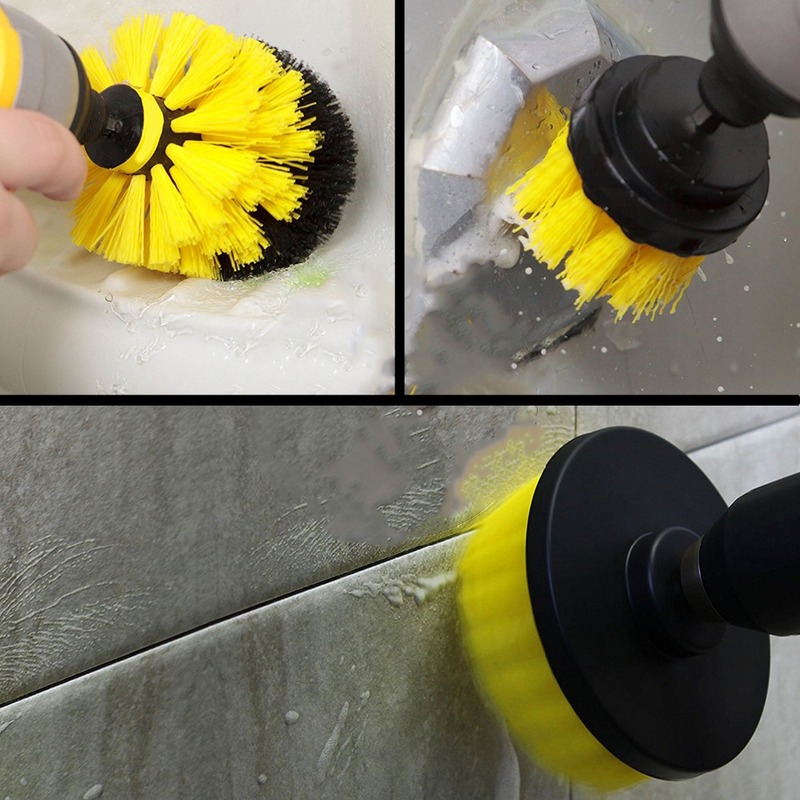 The Flat Round Brush is recommended for tile and grout, tubs and shower pans, drains, indoor brick and stone. The Drill Pads are great for many indoor uses, shower doors, tile and grout, sinks, toilets, baseboard, dirty interior doors, faucets, linoleum. Stone, Brick, Tile, and Grout, BBQ's, Outdoor Furniture, Hard Plastics, Pots, Stained Cushions, Rust on Metal, Hot Tubs, Pool Tile. The Flat Round Brush is recommended for most of your outdoor uses, the corner brush is used for everywhere your flat brush cannot reach. The Drill Pads are recommended for outside windows, car windshields, outdoor furniture.